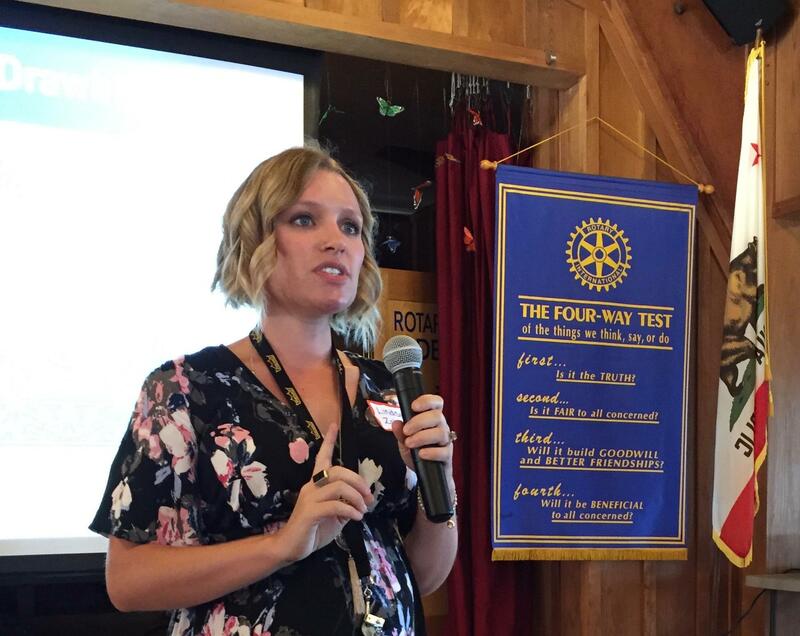 Resounding Joy Harnesses the Therapeutic Power of Music - Resounding Joy Inc.Resounding Joy Inc.
Lindsay Zehren, Director of Special Projects for Resounding Joy, and a music therapist, gave a presentation on October 5, 2017 about how she uses music to enrich the lives of her clients. Lindsay got her presentation off to a musical start- she played her guitar while singing the interactive song, “We’re in the mood for music today” that she uses to gauge the mood of her clients at the start of many sessions. Through this song she can assess how ready a child is to participate, what vocabulary they will use, and what movements they’re able to make. 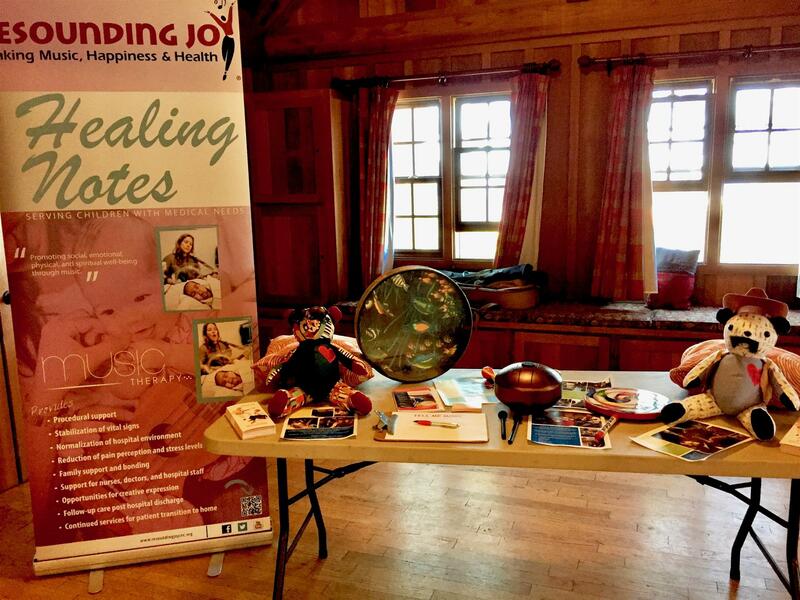 Resounding Joy was founded in 2005 by Dr. Barbara Reuer and develops therapeutic and recreational music programs that improve the overall well-being of individuals and communities. Their services are delivered through four core programs: Healing Notes (music therapy that supports children undergoing medical treatments); Mindful Music (recreational music programs for seniors; Semper Sound (music that assists in rehabilitation); and Sound Minds (use of music to promote development of preschoolers). Since its founding Resounding Joy has served more than 85,000 clients in the San Diego area. Lindsay’s presentation focused on a project she developed while she was an intern working with Resounding Joy that uses music therapy for children who have complex medical issues and are in palliative care. Lindsay explained that music therapy is evidence-based and draws on a large body of studies that concern human reactions to music, such as the concept of entrainment, a synchronization to music, which she said is most visible at sporting events, say, when Queen’s “We Are the Champions” plays. For her Healing Notes Palliative Care program, Lindsay works with seriously ill children and their families to help them use music to enhance their overall quality of life. One of her case children, 3 year-old Joey, recently transitioned to hospice care for a chromosomal disorder that affects his heart and lung function as well as his motor skills. Lindsay described how she taught Joey’s mother, Siobhan, the ukulele, an instrument that many people can master quickly and allows her to play music for Joey- his sister Grace also often joins in the music-making. One of the services the program provides is a Legacy Project. For Joey, Lindsay worked with Siobhan and Grace to write a song that describes all the things that they love about Joey, and then they gathered at the Resounding Joy’s Sorrento Valley studio to record a music video of the song that featured Joey.